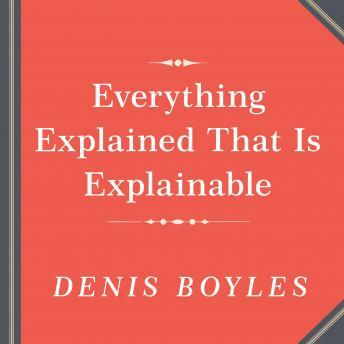 In Everything Explained that is Unexplainable, Denis Boyles tells the story of the American, entrepreneur, Horace Everett Hooper, a natural-born salesman who found an outdated set of reference books in a warehouse and sold them as "one-shelf libraries." His Western Book and Stationary Co. became one of the largest publishers in the Midwest, selling books directly to readers, and forging a business model that was forever after emulated. Hooper and his partner, William Montgomery Jackson, along with Henry Haxton, took an outdated, unmarketable edition of the Encyclopedia Britannica to the then struggling London Times and developed revolutionary new ways to increase the paper's readership, saving both publishing institutions from financial ruin. In a frenzy of editorial effort and fanatical conviction, the eleventh edition was put together as staffers raced against the clock to compile the 40,000 entries by 1,500 contributors. And then we see how it all fell apart, wrecked by a new owner of the Times and a disastrous courtroom fight between Jackson and Hooper-before it miraculously came together at the very last minute, saved by the unlikeliest of rescuers-Cambridge University Press.